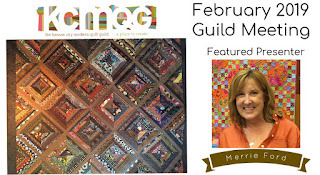 The Kansas City Modern Quilt Guild: February’s Meeting! Patterns Available From the KCMQG! Merrie loves the color Brown – a rare choice for a Modern Quilter! In her words, “What could be wrong with fabric that is the color of chocolate, coffee, caramel, toffee, nutmeg, ginger or cinnamon?! Be sure to bring your finished quilts and projects to share at Show & Tell! Bring a friend and join us for this fun event as we learn how Merrie loves to use the color brown in her Modern Quilts. Visitors are always welcome. Your first visit is free! Such a fun way to spend your Valentines Day! If you're a member of the KCMQG, join our private Facebook group! 2013 Kansas City Modern Quilt Guild. Simple theme. Powered by Blogger.